After 10 years of having organised International HCH and Pesticides Fora, the participants expressed their concern and called for a constructive regional action at the 6 th Int. HCH and Pesticides Forum in March 2001. Thereafter IHPA has approached Members of the European Parliament (MEPs) and EU Commission for help and engagement and drawn attention to this problem and the need for solutions, as requested by the 6 th Forum resolution. This resulted in questions by several MEPs on June 15 th 2001 to EU Commission, DG Environment being discussed in the Parliament. On July 10 th , the Environmental Committee of EU Parliament decided to send letters to the representations in Brussels of all 10 Accession Countries asking the respective governments if they were aware of the problems and if yes, what they were intending to do about it. Official reactions have been obtained from the Czech Republic ( 12 Dec 2001 ), Latvia ( 18 Sept. 2001 ), Lithuania , Poland ( 3 April 2002 ), Romania ( 3 April 2002 ), Slovak Republic ( 23 Sept 2001 ), Slovenia ( 24 Oct 2001 ). In May 2002, after the Nitrofen food contamination in former Eastern Germany , due to obsolete pesticides occurred, the dangers of obsolete pesticides became obvious. On 24 th of June MEPs questioned EU Commission again on the dangers for the food due to the obsolete pesticides and what EU Commission planned to do to prevent re-occurrence in the future. In July 2002, the decision approving 6 th Environment Action Programme was adopted and the Communication ‘Towards a Thematic Strategy on the Sustainable use of Pesticides’ opened another door by stating clearly that ” specific support programmes should be developed which target the safe handling for obsolete pesticides and their safe destruction “. “Collection and destruction of plant protection products, which became unauthorised after reunification of Germany , were not properly and clearly organised. There is no clear overview at central and Land level of the amount of theses plant protection products and the warehouses where they were stored.” This statement was made, after 14 years of huge West German investments, in this context one should try to consider how (im)possible it would have been for the other CEEC governments to tackle these problems! At the Stakeholders’ Conference on the Development of a Thematic Strategy on the Sustainable Use of Pesticides, on 4 th of November 2002 in Brussels , Mr. John Vijgen of IHPA requested EU Commissioner for Environment Ms. Margot Wallström to help to solve this problem and Ms. Wallström promised to discuss the issue in the cabinet and bring this issue in each meeting with the new accession countries. On 4 th of December 2002, 28 MEPs signed a letter to the 10 governments of the Accession countries, indicating the dangers to the food supply and the recommendation to apply to help via the respective PHARE Fund and referred to the statements you have made before. In March and April 2003, Ms. Wallström and Ms. Day, Director General of DG Environment, both sent letters to IHPA confirming the concern for the issue, however rejecting the idea of a special fund, but encouraging the use of existing funding channels for NIS such as TACIS, ISPA for the set-up of the necessary destruction facilities, as well as the use of the Structural and Cohesion Funds for those countries for the new EU Member States from May 2004 on. The Commissioner also referred to the fact that none of the countries have addressed the issue during the negotiations and that responsibility and initiative has to be taken by the New Member States. At the 5 th Ministerial Conference, 23-25 May 2003 in Kiev , in the final declaration the issue of obsolete pesticides and chemicals was included for the first time as an important issue to be addressed. During the conference the, “Verchovna Rada” ‘s (Ukrainian Parliament’s) Committee on Ecological Policy, Natural Resources Utilization and Elimination the Consequences of Chernobyl Catastrophe “, organized a discussion on the environmental problems in Ukraine , with main focus on obsolete pesticides. MEP’s Alexander de Roo and Charles Tannock participated in the discussion and confirmed the urgency of the problem in Ukraine . Just 2 weeks later from 5-7 June 2003 again in Kiev, 150 participants of the 7 th International HCH and Pesticides Forum expressed unanimously in a declaration the need to work towards the establishment of a POPs and Obsolete Pesticides Programme for Central European and EECCA Countries for the environmentally sound management of unwanted stocks of POPs and other obsolete pesticides. Also it was recommended to establish a Working Group to develop such Programme of Action in co-operation with all stakeholders. Additionally, support letters have been received from the highest governmental organizations in Ukraine :the Ukrainian Parliament , the Cabinet of Ministers, the Minister of Agricultural Policy, the Minister of Environment and Natural Resources and 31 Ministers of European, Caucasian and Central Asia governments inclusive United Nations Mission Interim Kosovo, Minister of Environment and Spatial Planning, 8 international organizations. Special attention deserve the individual support letters of Members of the European Parliament David Robert Bowe, Ms. Kathleen van Brempt, Alex de Roo, Ms. Catherine Stihler, Philip Whitehead and an answer from the Dutch State Secretary for Housing, Spatial Planning and the Environment, to Member of European Parliament Ms. Ria Oomen-Ruijten. Further a joint letter from four former Ministers of Environment Svend Auken ( Denmark ), Ms. Satu Hassi ( Finland ), Jan Pronk (The Netherlands) and Ms. Dominique Voynet (France) addressing to the 5th Ministerial Conference “Environment for Europe” the need for official support for the establishment of an Obsolete Pesticides Stockpile Programme for Central European and EECCA Countries. On the 3 rd of October 2003 , the Committee on the Environment, Public Health and Consumer Policy, amended the issue of obsolete pesticides in virtually all programmes for the Eastern EU Extension. Ukraine, and Deputy Head of the Committee on Environmental Policy, nature Resources, Utilization and Elimination of the Consequences of Chernobyl Catastrophe of the Ukrainian Parliament, Ivan Zayets visited the EU Parliament and discussed with a number of MEPs ( Dorette Corbey, Robert Goodwill, Marie Isler Béguin, Patricia McKenna, Bart Staes, Jan Marinus Wiersma, Alexander de Roo and Elisabeth Schroedter), Mr. Francis Jacobs (secretary of the Environmental Committee), Dag Sounders secretary of the Delegation to the EU-Armenia, EU-Azerbaijan and EU-Georgia Parliamentary Cooperation Committees, as well as representatives of the EU Commission (Jaime Pérez Vidal of the European Commission ‘ s DG RELEX and Martin Pohlmann of DG Environment) the issue of obsolete pesticides in Ukraine, dealing with 25000 tons of pesticides spread over 5000 locations. This visit has made it very clear that there is a strong interest by many groups within the Ukrainian society to solve this problem and to get the necessary support from the EU Commission. A full communiqué of the visit has been issued by Mr. Alexander De Roo and John Vijgen. The draft budget has been adopted in February 2004 and a report “Implementation of the 2004 budget, Working Document, on requests made to the Commission in resolutions relating to the 2004 budget, Committee on Budgets, Rapporteur: Jan Mulder” included the request for budget under ” Elimination of pesticides”. In July 2004, the new elected parliament started its works and Mr. Wieslaw Kuc MEP from Poland visited the 8 th International HCH and Pesticides 2005, in Sofia , Bulgaria . He had discussions with delegations from Ukraine , Poland and Georgia on the extent of the problem and how to find ways to solve obsolete pesticides issues in the EECCA region. He was very impressed on the special exhibition on obsolete pesticides in Georgia , that showed clearly the real impact on humans and environment. Following the Sofia Forum, Mr. Kuc established a Working Group on Obsolete Pesticides in the EU Parliament consisting of MEPs, their assistants and other committed persons. In September 2005 the Working Group had its first meeting with presentations by Mr. Kuc, John Vijgen and Ludwig Krämer as specialists on this issue. In the spring of 2006, Mr. Kuc introduced the idea of the organization of a special exhibition to be held in the EU Parliament in order to confront politicians on the real danger of obsolete pesticides and to convince them that actions must be taken as soon as possible. It is also Mr. Kuc’s intention that the exhibition should be brought to all European Capitals to commit politicians and to show the EU population the real situation and the dangers stemming from obsolete pesticides in Central and Eastern Europe, Caucasus and Central Asia . Why am I committed to the solution of the obsolete pesticides problem in Central and Eastern Europe ? After getting in touch with the organisers of the International HCH and Pesticides Forum, just a couple of days before their Forum, on 20 May 2005 in Sofia, they convinced me of the importance of this issue and therefore I decided to change my travel arrangements in order to join this till then Forum. When I then arrived in Sofia the Polish representative explained the situation in my own country and in the first moment I could not believe that Poland had these huge problems inherited from former Soviet times. representatives of the Ministry of Environment showed how serious the issue is. Pesticides are laying around everywhere as former pesticides stores had been demolished due to the lack of building materials for the poorest. Pesticides are freely accessible to playing children, grazing cattle and so bringing obsolete pesticides in our food chain. Due to rain and wind pesticides are spreading to neighbouring areas and entering ground and groundwater polluting precious ground water and surface water where the poor people extract their drinking water from simple wells. And the worst is that rural population and their governments often are not aware of these “hidden” dangers. So I decided to carry out all possible efforts to make my colleagues in the EU Parliament aware of this problem, but also to convince them of the need to act. Therefore I have initiated in September 2005 the first meeting in the Parliament and invited MEPs (Members of the European Parliament) to discuss the issue and the ways towards solutions. During this meeting it was decided to establish a Working Group of MEPs that then could help to move the issue forward and to define clear and achievable goals. On 1st of February 2006, the first meeting of the Working Group on Obsolete Pesticides took place in Brussels . During this meeting we were happy to find more and more MEPs of the New Member countries, as it may be clear that we have to take the lead if we seriously want to eradicate obsolete pesticides from our countries. We know that there is still not enough done to protect us against the risk related to obsolete pesticides. Various reports and presentations demonstrated the potential impact of obsolete pesticides and other hazardous chemicals on the environment and on problems of soil and groundwater contamination. WHO has estimated that in 2050 every second human being will die from cancer due to contamination in food, water and the environment. There are thousand of tons of obsolete chemicals placed in the Southern and Eastern European countries, which are located without any protection against wind or precipitations. This broad and important theme requires more attention and action on the international agenda in order to reduce risks to the global environment and to communities. The economic consequences of not taking action could lead to a loss of opportunities for exports in the agricultural and fisheries sectors and for reduced opportunities for the development of sustainable tourism. The main objective of our meeting on February 1, 2006 was to create an actively functioning Working Group which would create and enforce new harmonised EU policy on defining, registering and destruction of forbidden obsolete pesticides. 2. We should establish Guidelines and supporting measures to make inventory of pesticides and to control their destruction. There are technologies, but are they optimal and fully effective? There must be new facilities established which would support the control of pesticides on their life-chain: from the producers till the end-users. 3. We have to develop and implement education and awareness raising tools. Series of events should be planned to support the environmental issues and to explain the danger of obsolete pesticides. 2. Bringing the issue to the agenda of AGRI or ENVI Committee with the purpose of making a resolution in the committee for the creation of the budget line. 4. Organisation of a special photo-exhibition in the European Parliament by one of the MEPs. The talks with the MEPs and the EU Commission’s officials should follow in next weeks. What have we realized till present? Since the February meeting, we have now achieved the first results of our efforts and we have agreed upon to organize an exhibition “Danger obsolete pesticides” in the European Parliament from April 30 th to May 4 th 2007 in Brussels. We will invite all politicians and representatives from the concerned countries and involve press and TV. Further is the plan that the exhibition will go around Europe so all citizens in the countries and politicians have the chance to see the real situation and can act together with us. We have now also decided to publish a book with interviews of politicians and specialists in this field in order to document clearly the urgency of the problem. And finally we have to engage donors to solve this problem as soon as possible. 4. MEP Dan Jørgensen visits Azerbaijan in March 2012! Mr. Dan Jørgensen, Member of the European Parliament, Vice Chair of the Committee for Environment, Public Health and Food Safety, visited Azerbaijan from 8 to 11 March 2012, and met several Members of the Milli Majlis (Parliament), and Mr. Ismat Abasov, the Minister of Agriculture, as well as Dr. Shahin Panahov, Chairman of the UNEP-Ecores National Committee working on POPs issues in Azerbaijan, to discuss the pesticide activities in the country. At the end of the meetings, a group has visited the refurbished obsolete pesticide burial site in Jangi village located in ~50 km from Baku. 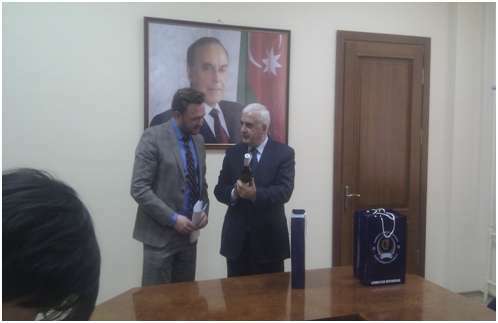 MEP Dan Jørgensen meeting Mr. Ismat Abasov, the Minister of Agriculture of the Republic of Azerbaijan .